I detect vested interests in some of these messages. I don't do that... I'm Henry of LGC ... I don't care if you order from me or not. What bothers me is the lack of understanding of what leather is. I just got a DVD from a company who will remain nameless because they refused to let me use their info on my blog. They explain tanning... it isn't leaving it out in the sun. Try looking at the wickett&craig web site. They, the nameless, also have video from the main tannery in Mexico that is supplying belt leather to the US. ... (which I don't use). What is the difference between drum tanning and pit tanning? Answer: about 4 months. Oh, hey.. thanks to the customers who recommend me in these forums. I'm really impressed with the feed back I get. I would just be happy and not offer a thank you if I got something I liked. Random quilted-y belt from a thrift store. Various plaid patches on a basic green canvas thing. My 15-year-old female ditzy cousin pointed out that it looks vaguely like Burberry, and there's no branding anywhere so it's probably some generic thing. I really like it, though. Edited: I didn't know my camera phone had that much resolution, was too wide. 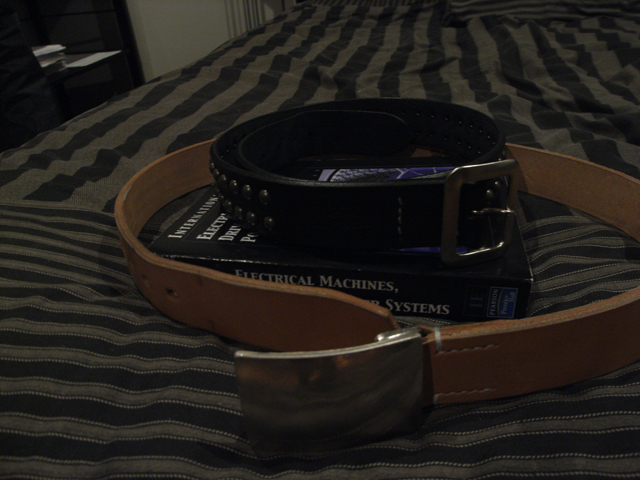 These are my two favourite belts at the moment. How does it compare to the samurai belt? Veryy nice. What jeans are they btw? so I just need to figure out which is sturdier. Obviously both are hefty. Whoops, thanks for being my brain! are there any other sites where this is available? annnnd kiya, when are you guys getting the flathead wax and how much will it be? so when you are buying a belt do you look for it to fit somewhere in the middle holes or at the smallest hole? just curious what others thoughts are. one of my old coworkers was talking about how a belt was suppose to fit but i forgot as its been a while. i say somewhere in the middle because what if you gain some weight? lose weight? Mmm, I thought the point of the IronHeart belt is that you could undo the two screws behind the buckle and cut the free square end (not the tounge) to whatever length you want (punching two new holes), provided the belt was long enough in the first place. No? thats what i thought too. the top buckle bit is removable, leaving a room for the untouched top which could be trimmed. That one is crazy. Where did you get it? Comment on ALD belts - lovely but wide. 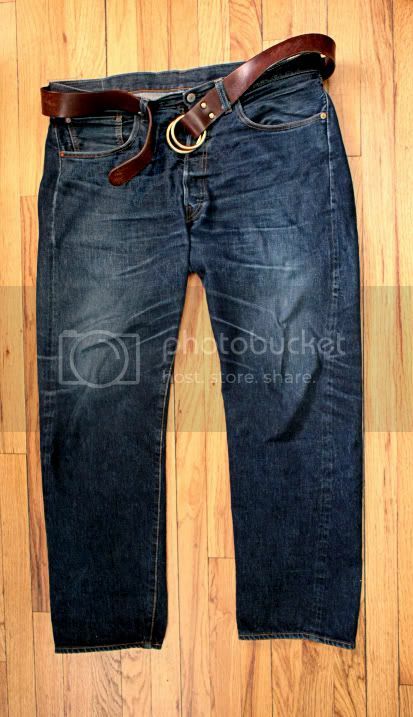 They're really designed with ALD jeans in mind (unsurprisingly) but will fit Nudie's OK. Duckdiggers too but on other stuff the belt loops will probably be too small. Something I keep in mind - how much the belt extends past the last hole. Particularly important if you've got a small waist and / or if you're using the first hole as you end up with a very flappy awkward bit of leather to tuck into a belt loop. 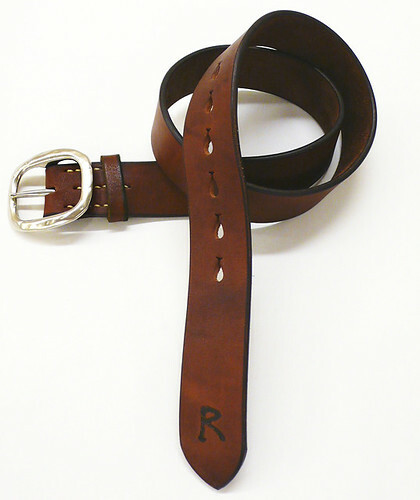 The 45rpm belt above, while lovely, puts me off for precisely this reason - too much leather after the 6 hole from buckle. Does anybody else get that annoying fold after having a belt for a time? I'm talking about the fold right in front of the hole where you usually buckle the belt... after constant usage, sitting down, moving around, I guess the leather wears down and begins to bend. It's not noticeable while the belt's on, but when it's off, it looks pretty floppy. 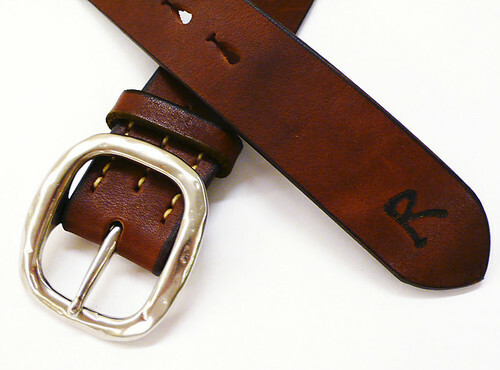 Context ALD belts on sale until tomorrow at noon for a lot cheaper. I have an insane number of thriftstore belts and buckles. I live in fear that people I know will find out how many I have. First picture is all sterling buckles. I only ever wear the four on the left. All the belts are thrift store except the four basket weave which are made by Vogt. Miscellaneous thrift store belts. The ugly shiny ones in the middle are alligator. I wear the first and third from the top quite a bit. biography: I don't care who you are. I'm using Kc's garrison belt. they really match with Jeans! !